A senior British minister has made the strongest warning yet about the prospect of a united Ireland if there is a no-deal Brexit. 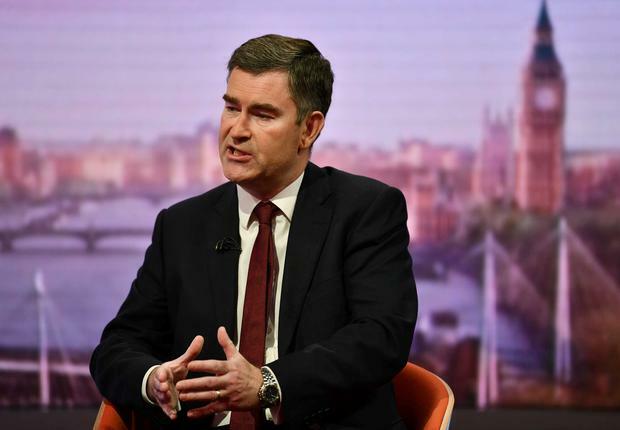 Justice Secretary David Gauke has said he worries “a great deal” about what a crash-out Brexit would mean and said it would put the future of Northern Ireland in the union “in some doubt”. The remarks are being viewed as a message to the Democratic Unionist Party (DUP). The party has been vehemently opposing British Prime Minister Theresa May’s Withdrawal Agreement due to concerns that the so-called backstop to avoid a hard Border in Ireland would threaten the union with Britain. Mr Gauke’s remarks came ahead of another crunch week as Westminster again tries to seek consensus on alternatives to Mrs May’s deal. The deal itself may be put to the Commons again. He was asked on the BBC’s ‘The Andrew Marr Show’ what a no-deal Brexit would do to the country. “I think it would be very, very bad news indeed,” he said, citing the economic consequences as well as security concerns. “I do worry a great deal about what that will do to the integrity of the United Kingdom. He said a no-deal scenario would see the UK government have to impose direct rule and would bring about a situation “where we were essentially heading towards a hard Border between Northern Ireland and the Republic of Ireland”. Last night, a DUP spokesperson responded, reiterating the party’s concerns about Mrs May’s deal. “A deal which places a trade barrier between Northern Ireland and the rest of the United Kingdom undermines the economic and constitutional integrity of the union,” they said.